For the Stampede, I went overboard... by my standards at least! It's my big kid's birthday this week, so I decided to put a wee extra effort into a super special card. Hey, she's kind of hard to impress at 11 years old already! I created this easy tri-fold card using The Cat's Meow and Celebration Balloons, as well at Little Cat Agenda and sentiment from Birthday Wishes. The background was created by blending inks together and freely splashing water droplets on top. I can never get over how neat this technique looks! So, here's the card when the recipient gets it... Nothing extraordinary right? But then you unveil this cool scene! And all those kitties at the bottom all wishing you Hooray, Happy birthday! I used a glitter pen to draw in the balloon strings, it was a nice touch without being too much had I used black. All images were colored with Copic markers. and joining us again is our guest designer Amy Yang! whoo hooo... love me some M.E! I love the celebration balloons! Cute card! You know you have a great product when someone who isn't even a cat person (me) now thinks she *needs* this absolutely adorable set! Awesome & unique design. Love it mama elephant. ooooh love the whole layout and of course, the kitties! Very fun tri fold card. I like the colorful cats. That is adorable! I'm sure she will be impressed with this one! These are the absolute cutest stamps and dies yet. Love the entire release! What a wonderful project and amazing release. I bought the kitty and bear accessories dies to make baggies at midnight and cannot wait to receive them. Thank you so much and congrats ME! I'm sure she will love her card! And I can tell you took extra effort and time!!! I follow on Facebook, and Shared. I follow in Instagram, and shared on it. Awesome release. Love those cute card and wordings. Your tri-fold card is just awesome! I have that sentiment stamp and it makes me laugh too! It's so beautiful! Love all the work that went into your card. Here kitty kitty! Love the kitties and ballons! 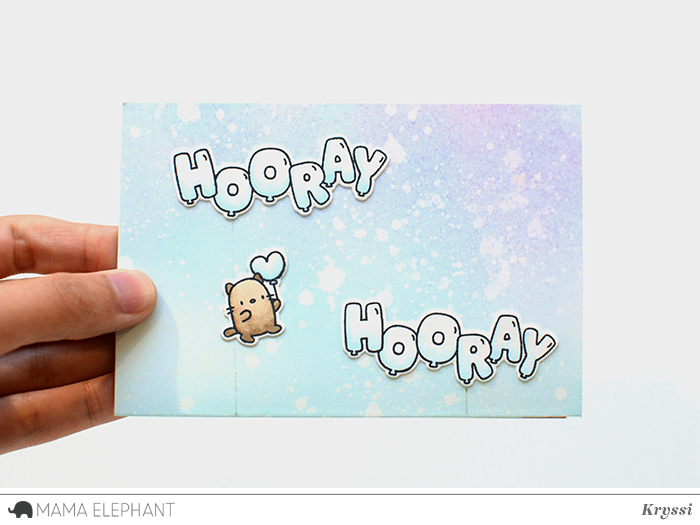 Love the adorable card as well as the new release! I love these cats and the balloon sentiments. Great card. Absolutely AMAZING card! I <3 it! Happy birthday to your wee one! And excellent card I love it!!! I like you on FB and shared your latest post about the new release. Simply adorable card. Love the cute cats! Oh my word...super duper cute!! Darling card! Love all those cute kitties! oh this is a super fun and cute card! Great release. Love the Cat's Meow and the Celebration Balloons stamp sets. Such cute cards- love this stamp set. That cat's meow set is truly THE cat's meow! LOVE it! Love this release! So stinking cute!!!! Cute cards on the hop. Love the crowd of cats. What a fun release. 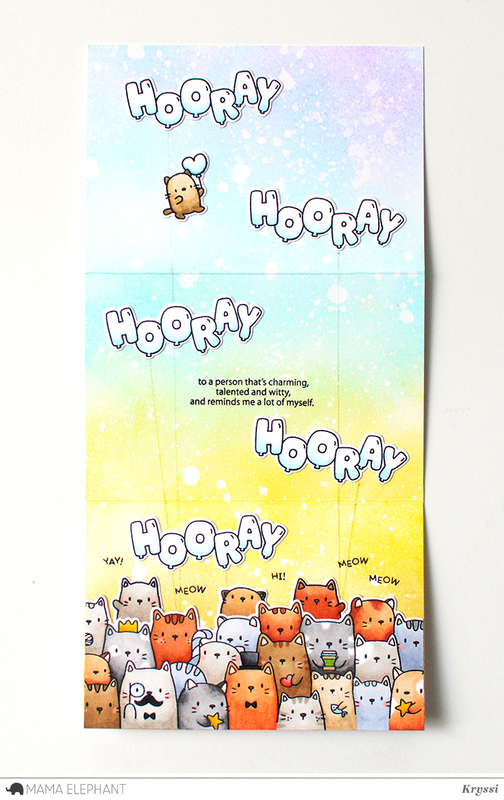 Love the cute crowd of kitties on your card. Another great release! Looking forward to the inspiration on the stampede. These kitties WILL be part of my collection soon. So cute!! Love the cat group and the balloons !!! I love the cats! Too adorable! Please make a dog one like that too! A totally adorable card. Love the long format. Love the new products! Thank you. I love these two sets so much I already bought them! Can't wait to play. What a fun release! Can't wait to see more! Your latest release is simply amazing!!! Definitely your best release yet! I love it all!!! That tri-fold card is the best ever. The coloring, cats, and sentiment are great. The Cat's Meow and Celebration Balloons are a must have for me. I just stumbled across your site and I am in love with sooo many of your stamp sets. From the letters, to the penguins, and the CATS! My birthday is next month and you can bet I will be asking for gift cards to Mama Elephant! I over the cat crowd stamp! Will be so hard to not get them! Love the tri-fold card and the new cat's meow stamp! Balloons are a must have stamps! So cute. Love that balloon set and the sentiment too!!!!! Thought your card was so cute. I love the balloon letters. Surely your daughter will be impressed. Love all your new release ! Order a bunch or it at midnight! You have the cutest stuff!! Love ❤️ Mama 🐘 Elephant!!! OMG, I love those cat's and the balloons, so fabulous. I must have both sets. Such cute new stamp and die sets. I am looking forward to picking up the stamps, but oh my, being in my late 60's, it does get difficult to work with all these small images and dies. I would love to receive that card, it is adorable. Ha ha, I know what you mean about going a little further to impress the kiddos at that age.. My daughter is 10 and can critique a card with the best of 'em! This is a great birthday card, love those cats!!! Love the balloon words! Your stamps are so versatile. Love them! Love, love the balloons stamps BUT they have already sold out. Any idea when they'll be back in stock? Wow.your card is Awesome..the trifold makes it s interesting and i loved the whole bunch of cats wishing..its Fun ! great card! love these kitties! Adorable card. That crowd of cats is the cat's meow! Love the tri-fold. And the cats are just too cute. 1. Awww!!! How cute!!! Love these adorable cards!!! Absolutely awesome card. I'm sure your daughter will love it. Really great release. Such fun products. I love the celebration balloons. Your stamp sets always put a smile on my face!!! You have such adorable illustrations! The Cats Meow is another winner! Awesome and very fun release!! WONDERFUL! Love the new kitties so much! That large cat stamp is the cutest! OMG love all these kittens! Too cute! LOVE those balloon letters! And those kitties are adorable! Just to tell you how cute this card and stamp is... I hate cats and I am terrified of them but I have fallen in Love with these cats and even ordered the stamp! Thanks for sharing this stamp and card! Such a cute card! Love the new products! Love all those kitties! A really cool idea. I like! Especially the colors of the card, the sentiment and definitely the crowd of cats! Another great release from Mama Elephant!! And your card is awesome. I love all those cats and those fabulous balloon words! I like and follow M.E on Facebook. I also appreciate your shorter blog hops. Another awesome release!!! You guys never fail to impress with all this cuteness!!! What a gorgeous card! I do hope your daughter loves it as much as I do! I've shared on FB (not.amanda)! The card is stunning! I love The cat's meow kittens!!! I've shared on Instagram (not_magda)! Really love this release! Stampede just might be the best ever. So looking forward to this release!! This release is absolutely adorable!!! Those cats are so fun, and I love how this card opens up! I like ME on IG. These little kittes are so cute! pleeeeease pick me pick me pick me pick me pick me pick me pick me pick me pick me pick me pick me pick me pick me pick me pick me pick me pick me pick me pick me pick me ! random generator over heeeeeeere please!!!! Wonderful release and lovely card! I love the fun sentiment! i'm so enthusiastic about these new stamp sets!!! hooo how infinitely cuuuuute!!! random generator piiiick meeee pleeease!!!! i follow on instagram and love your posts! such cute stamp sets! What a sweet release! The cats meow stamp set is a must have!!! I am whiskers-over-paws in love with that clowder crowd of cats!! You're the cat's meow!! I follow on Twitter and retweeted about the Stampede. I follow on Facebook and shared about the Stampede. I follow on Instagram and reposted about the release. I love the Cat's Meow stamp set. Will you be making a doggy one? Would love it! Love the card and such a great idea with the balloon strings!